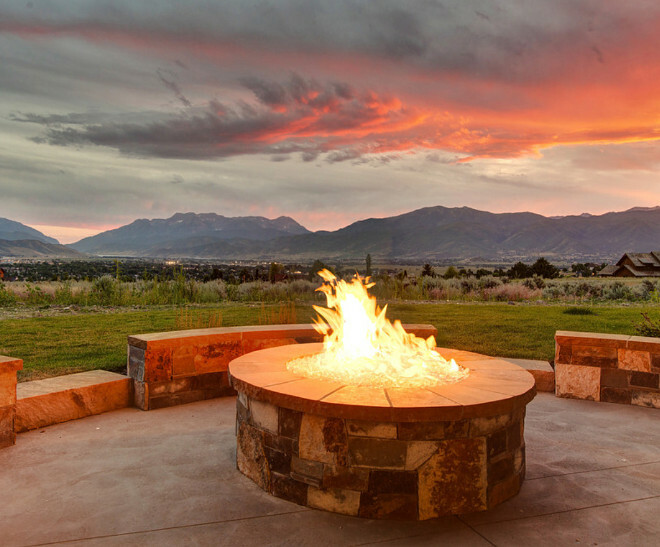 For many people, building their dream home is a once-in-a-lifetime opportunity. 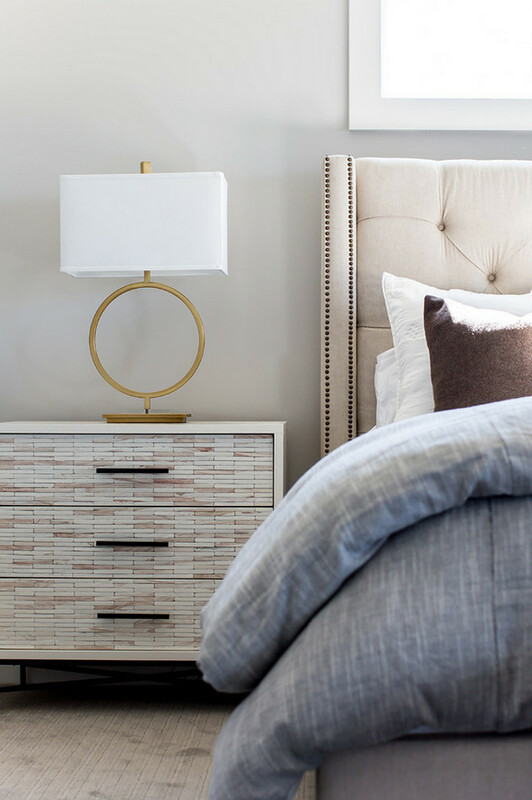 The key to turning the dream into reality is following a methodology that maximizes results at each stage of the design and building process. It starts with a blank sheet of paper and an idea… the dream… then evolves to selecting the lot, architectural design, materials and colors, and finally, building and finishing. 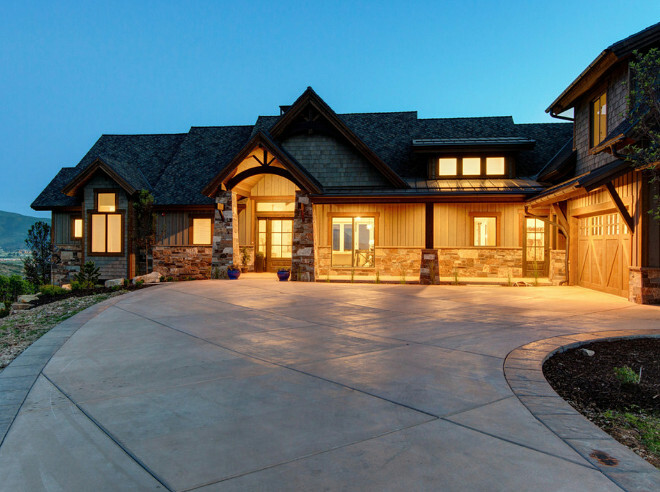 ​A great builder, like the one who built this home – Timberidge Custom Homes, shepherds a client through this often overwhelming process, adding value every step of the way to ensure the best result in each discipline, and acts as the key advocate for the materialization of the dream, while keeping everything within budget. 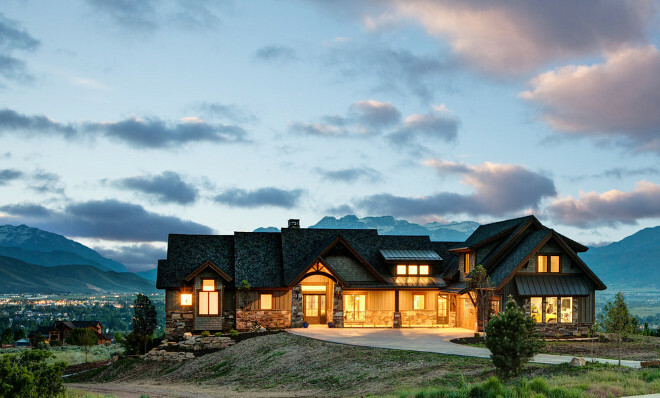 This timber frame style home is, in my opinion, a masterpiece. 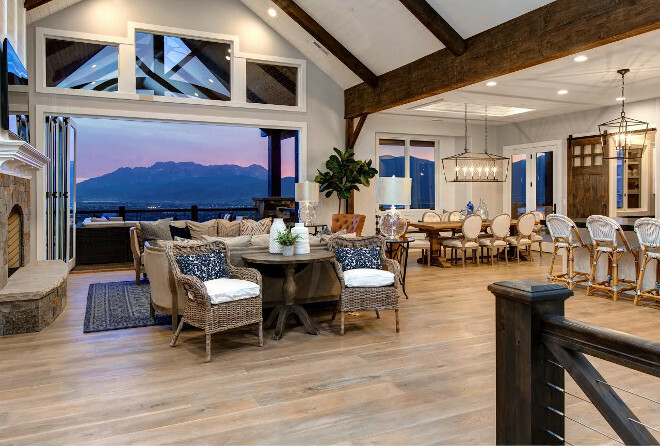 Combining an open floor plan that is perfect for family living and entertaining, this home truly embraces its vast mountain and city view. Every space was meticulously designed and its presence seems to be natural, as if it always belonged in this location. 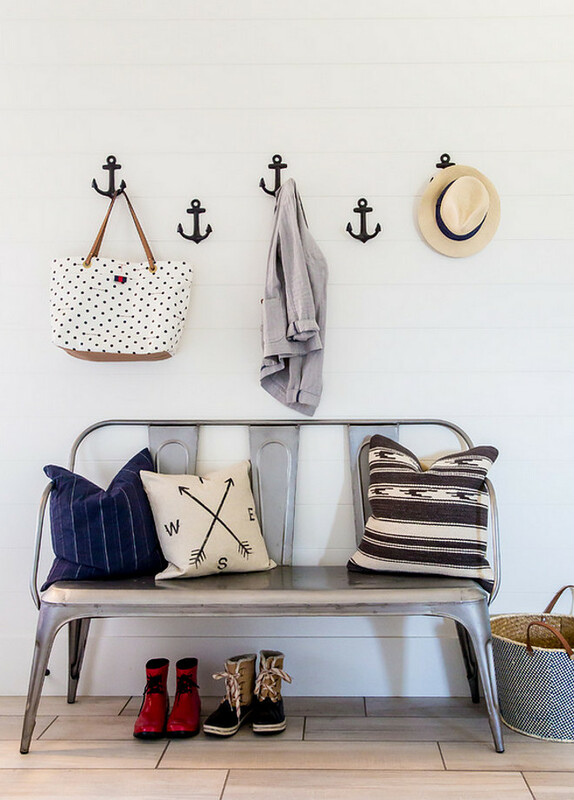 Welcomed to this home tour… I know you will feel inspired. 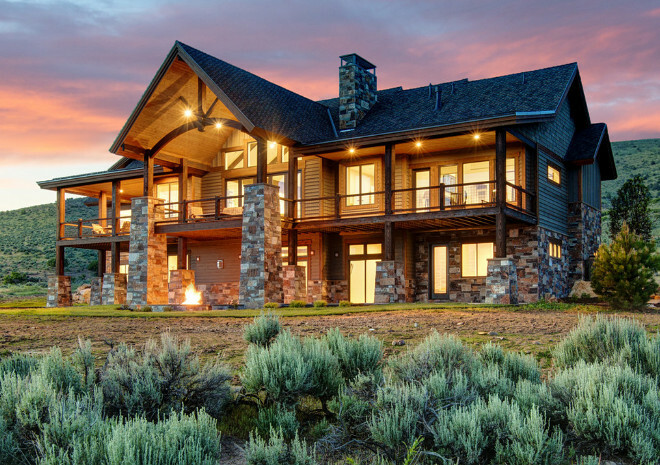 This home is beautiful and inspiring from every aspect. The exterior paint color is Kwall SC Gray. 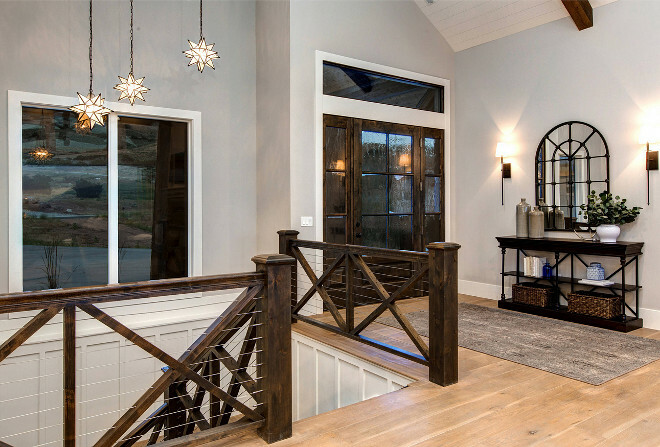 A custom alder door with sidelights open to the expansive and open main floor. The main paint color in this home is “Sherwin Williams SW 7641 Collonade Gray”. 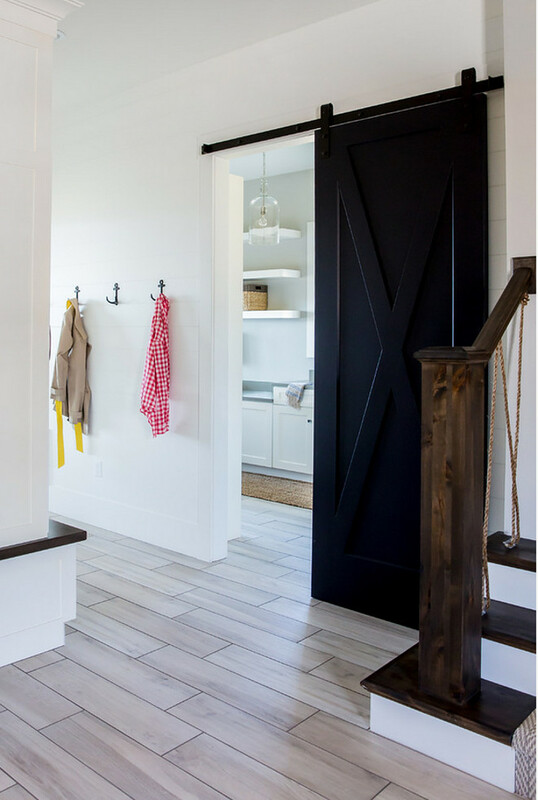 Also made of Alder, the staircase brings a modern farmhouse feel to this home. 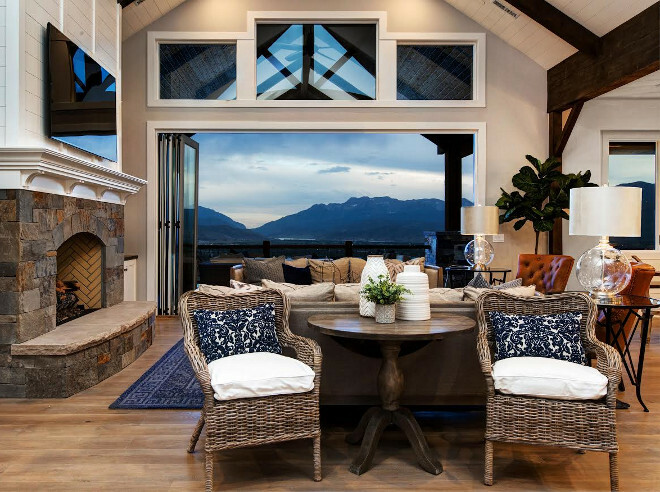 The open layout of this home frame the truly impressive mountain views. 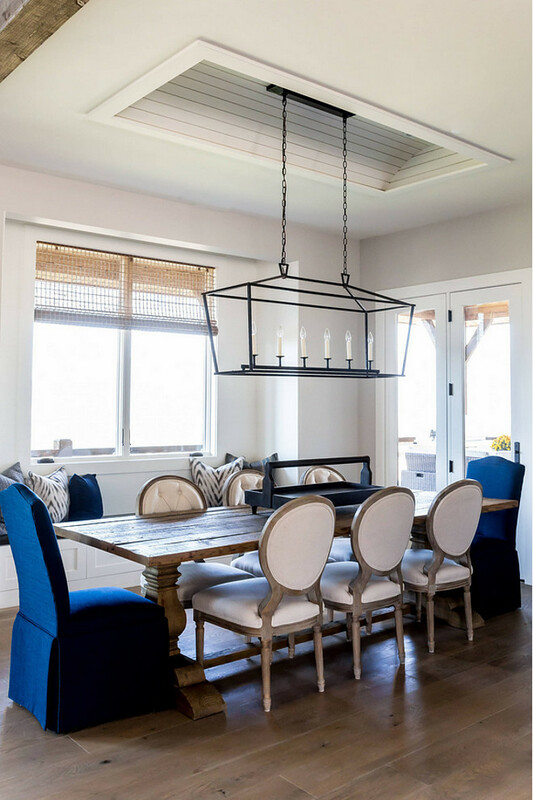 Flanked by a pair of wicker chairs, this round table had the top customized to be placed behind the sofa. 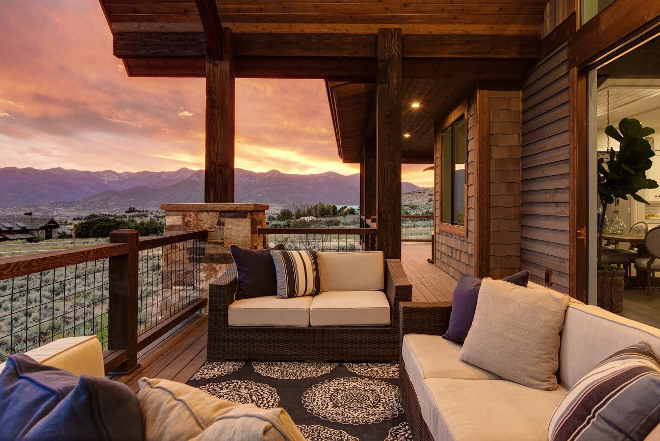 Accordion patio doors allow the indoors to feel completely connected with the outdoors. The furnishing here is comfortable and perfect for this environment. 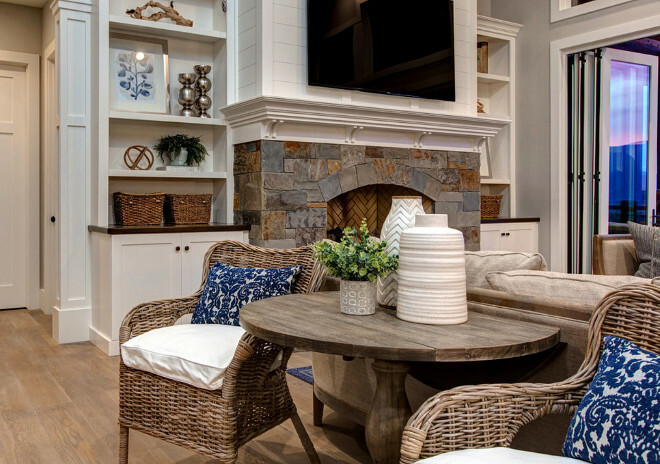 This classic seating layout invites you to sit down and have a good time with your guests. This view is truly breath taking! 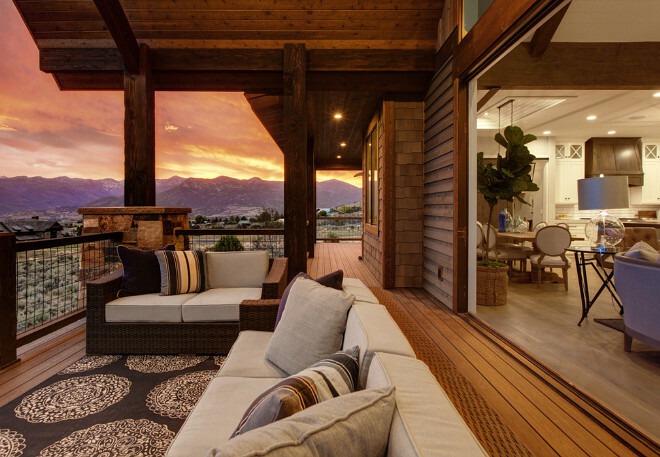 The patio doors open to this timber deck. 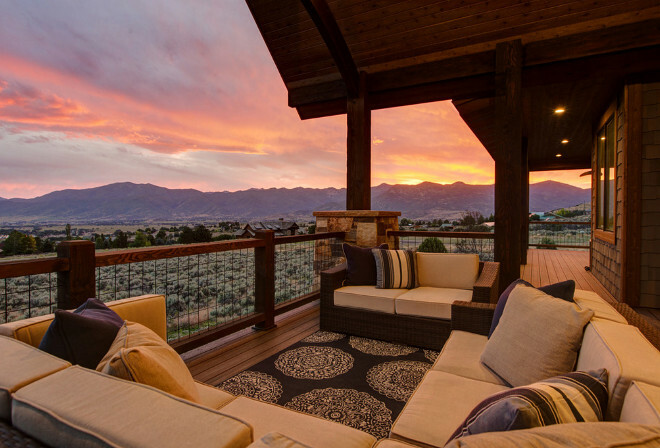 All rooms from this side of the house open to this extensive outdoor space. The view from the living room to the entry. 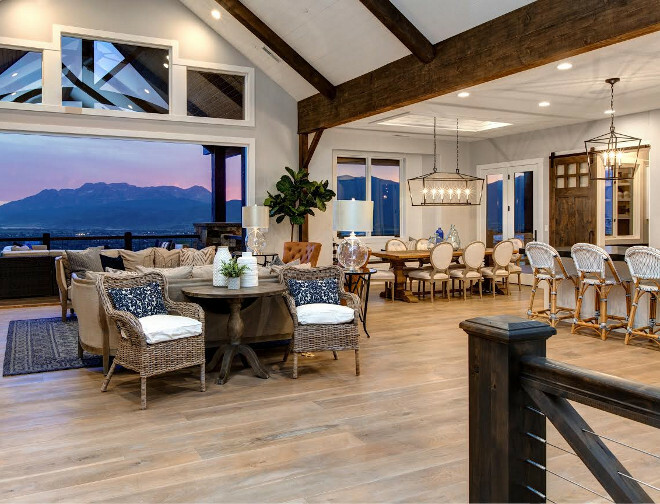 The vaulted ceiling features shiplap and exposed beams. “Collonade Gray by Sherwin Williams” is a calming greige paint color that works beautifully with this flooring. 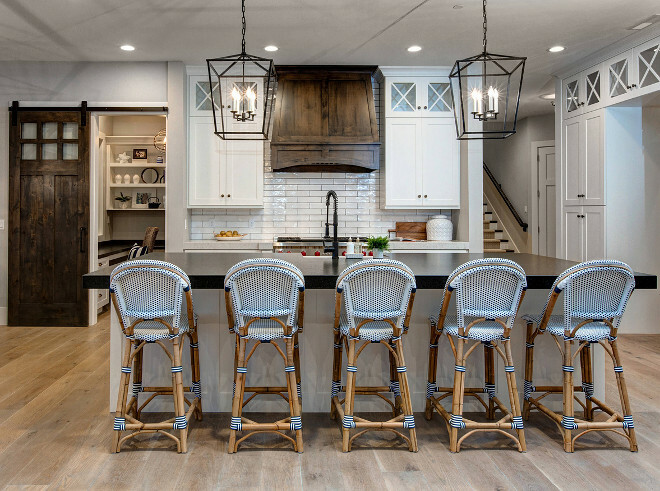 This truly is a dream kitchen! 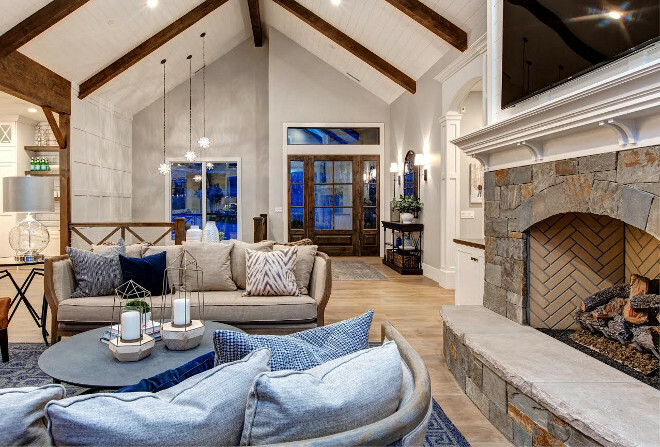 I love every detail here but especially the layout… see more and you will understand why! 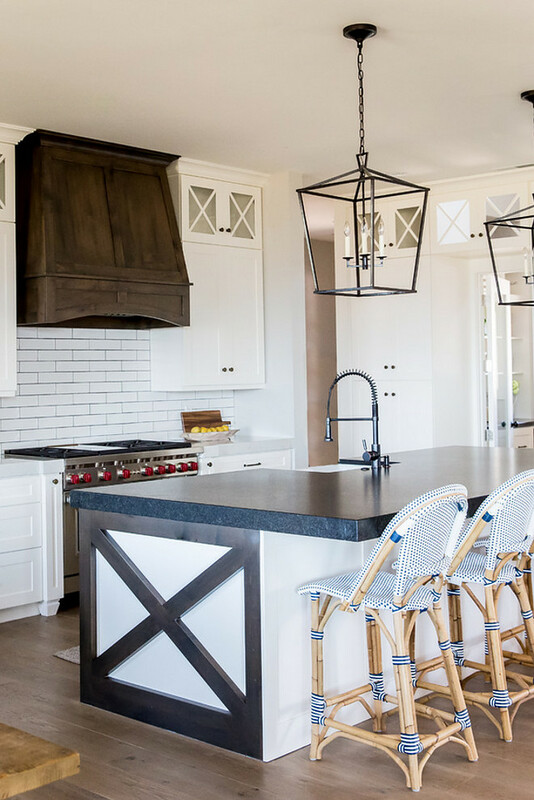 The kitchen island features a farmhouse-inspired x-crossed trim on sides. Countertop is Leathered Indian Pearl Granite. 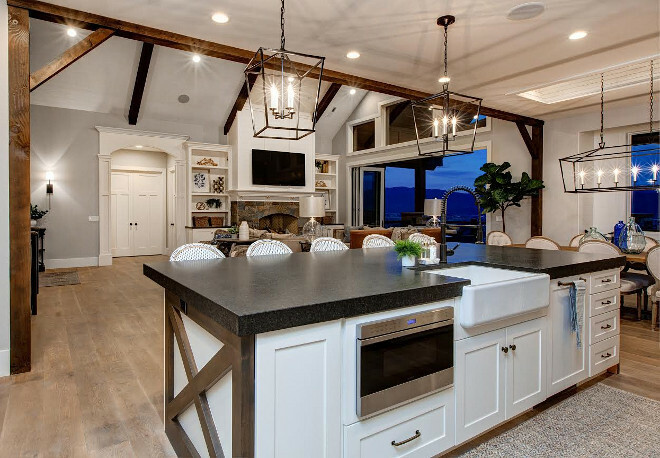 The island becomes even more exciting with a thick countertop edge! 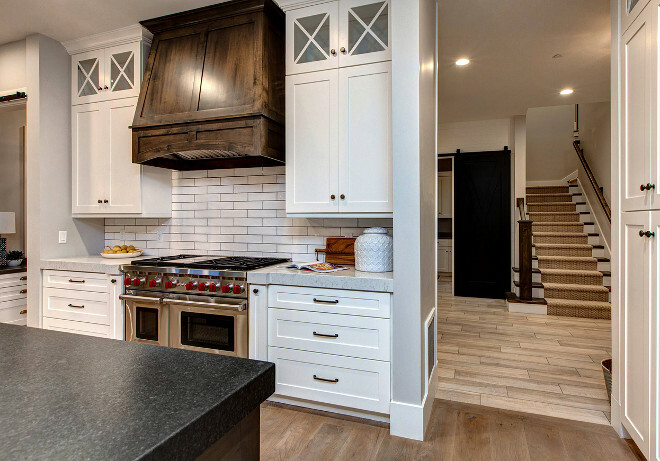 The countertops have a 3″ mitered edge on them. 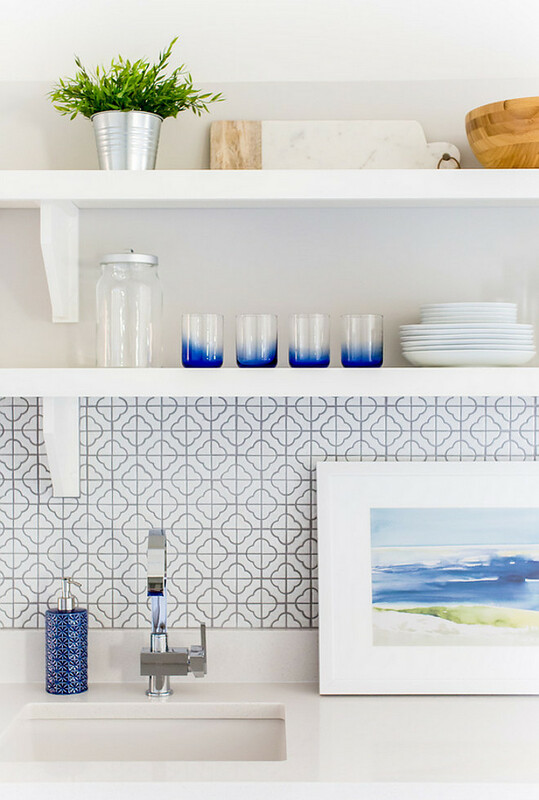 The backsplash is a subway tile from Daltile. 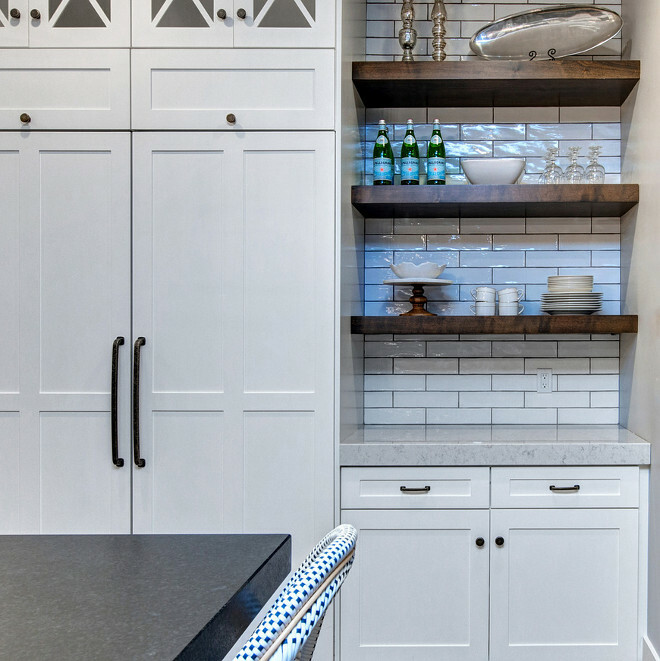 The perimeter countertop is a marble-looking quartz. 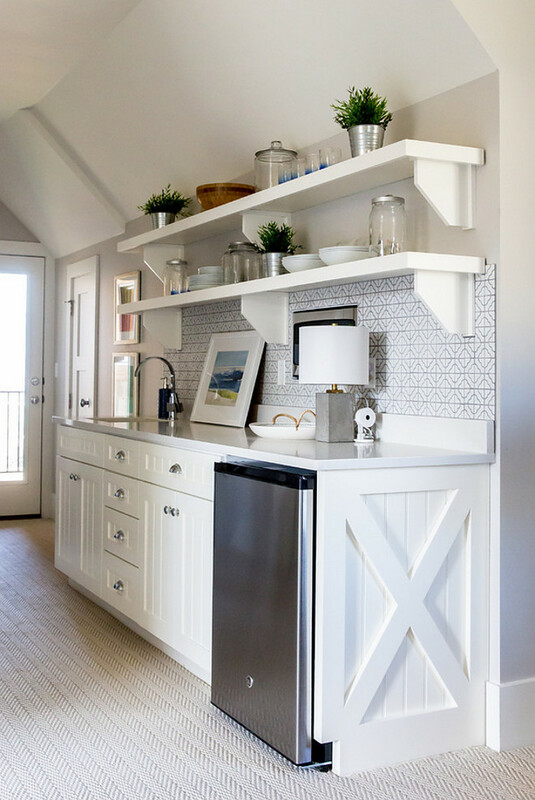 A walk-in pantry is located off the kitchen on the left, while open shelves , on the right, add a farmhouse feel to this space. Isn’t this entire area very creative? 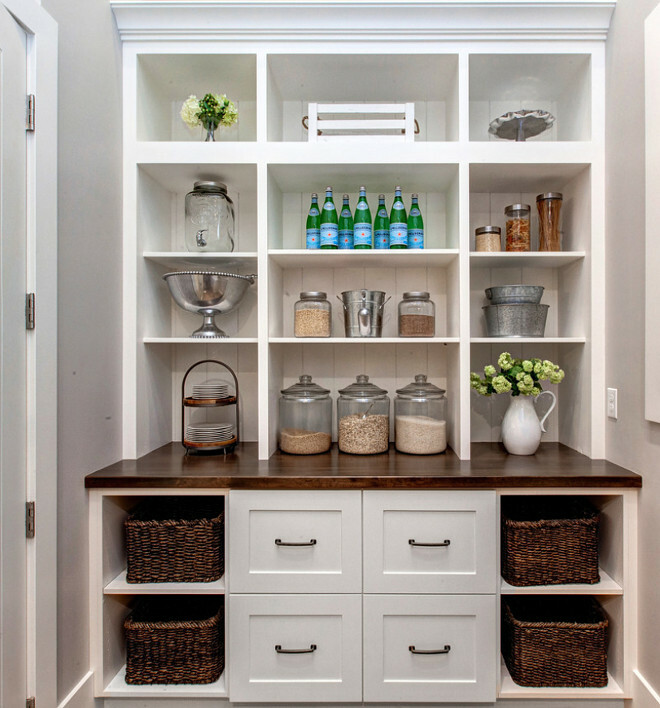 This kitchen pantry features built-in cabinets with open cubbies, butcher’s block countertop and wicker baskets. The cabinet paint color is “Sherwin Williams SW 7008 Alabaster”. 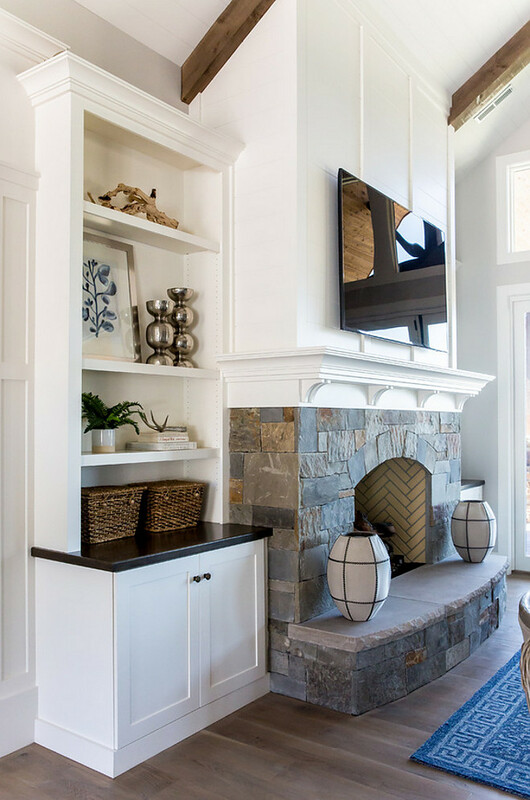 The custom open shelves are made of thick Alder wood. 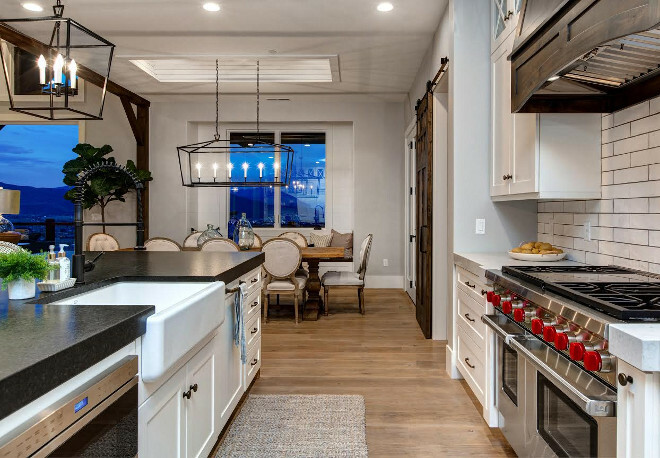 This kitchen feels connected with all of the main spaces. 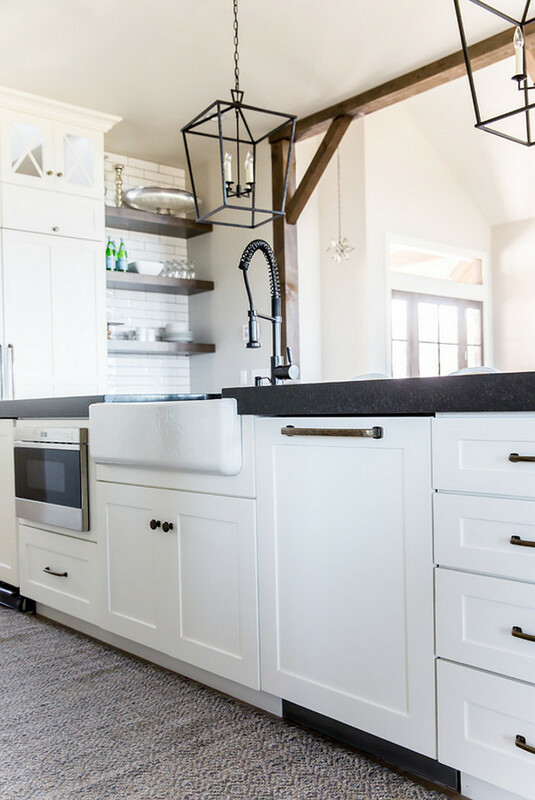 This white farmhouse kitchen island features thick lathered granite countertop and alder X side panels. The island is painted in Sherwin Williams Alabaster. 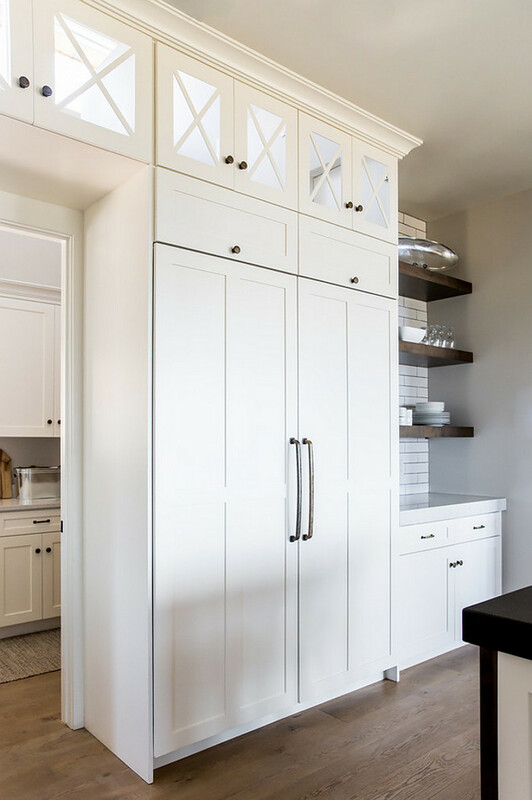 The cabinet hardware is made by Heber Wood Classics. 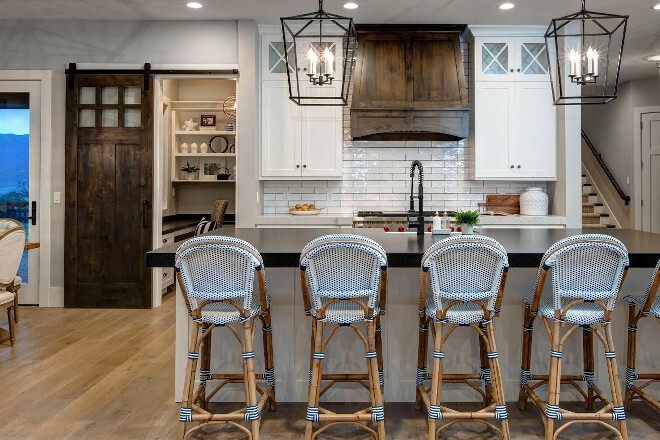 This kitchen is really the “heart” of this home. 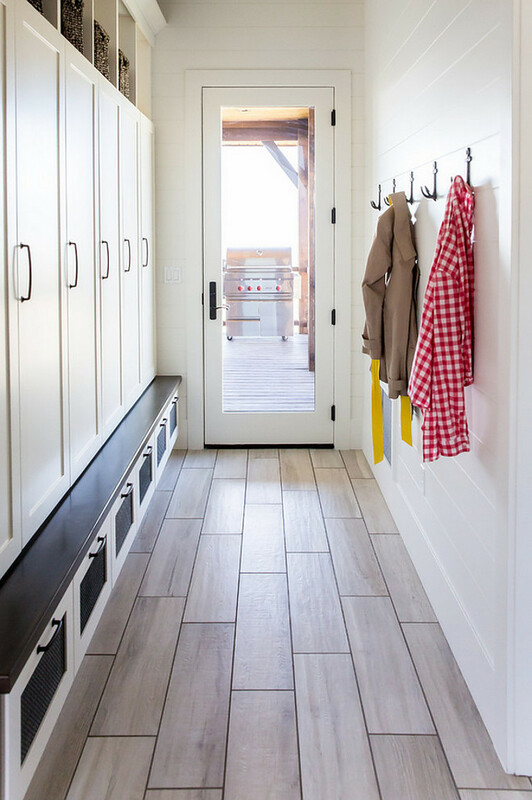 It feels close to important rooms such as the mudroom and laundry room (ahead). 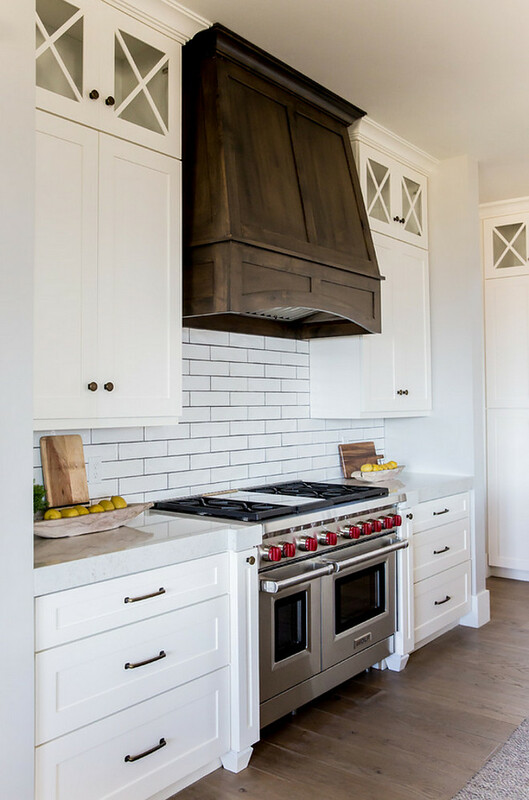 The custom Alder wood hood is stained in a dark stain color. 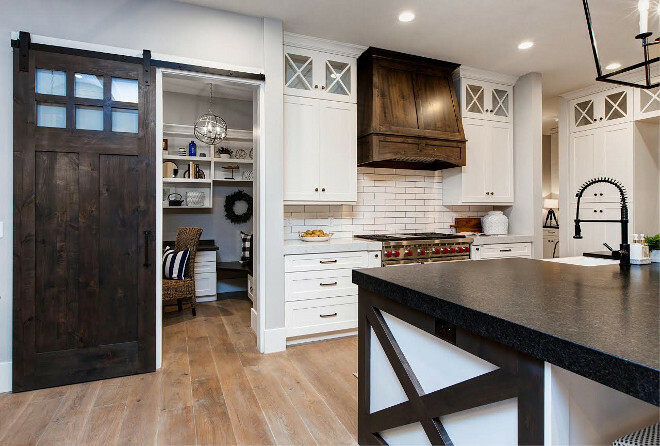 The hood and barn door stain color is “Smoke” from “Jones Paint and Glass”. 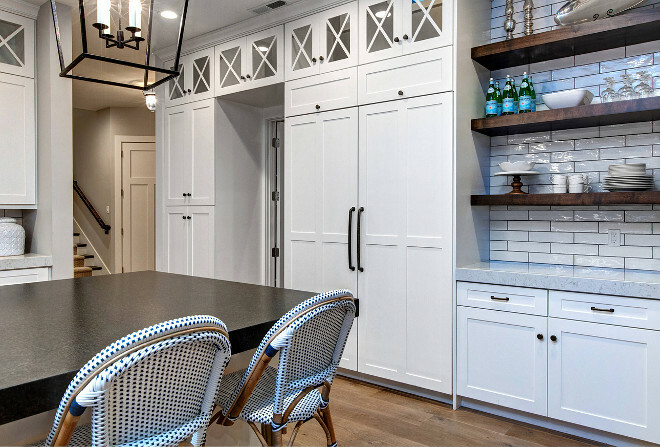 Cabinets are SW Alabaster. The backspash tile is a handcrafted (irregular surface) tile that is 2 3/4″ x 11 3/4″ from Dal Tile. 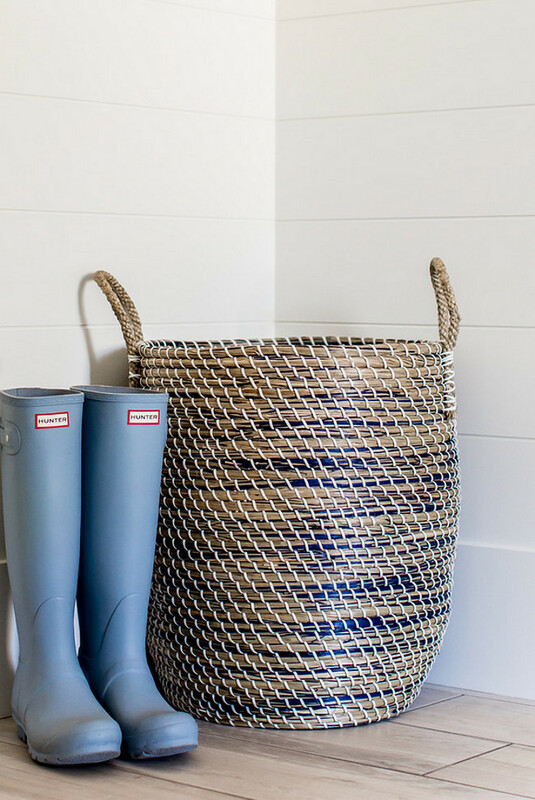 The grout color is Natural Gray. 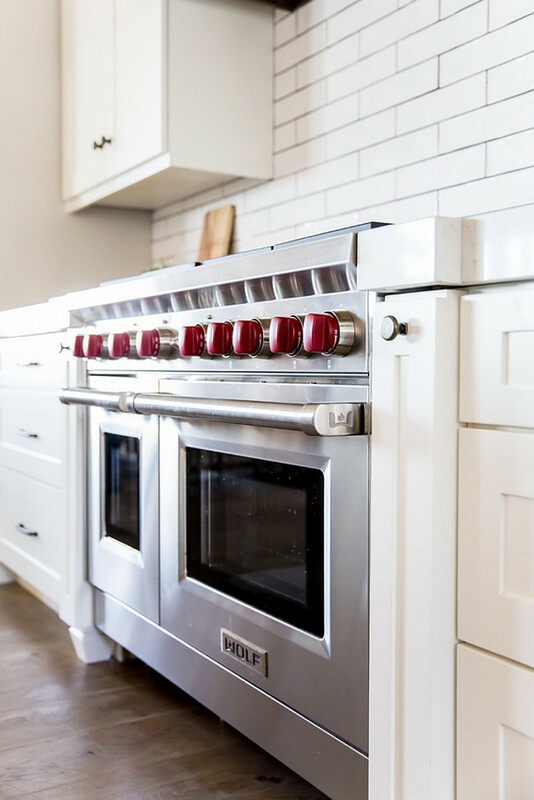 Range is a 48″ gas Wolf range. Kitchen faucet is from MR Direct. 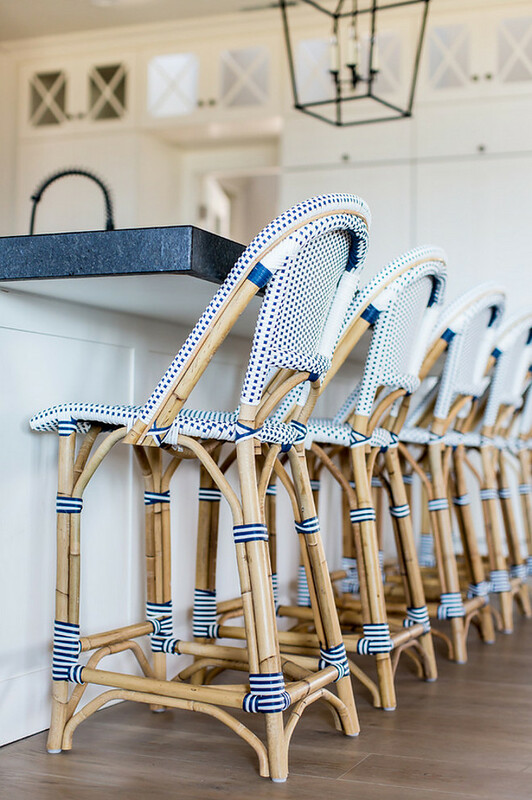 The blue and white bistro barstools are Serena & Lily. 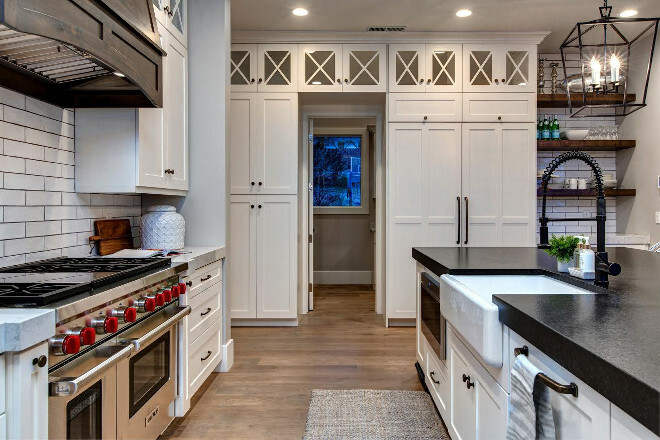 Didn’t I tell you this kitchen has an amazing layout? 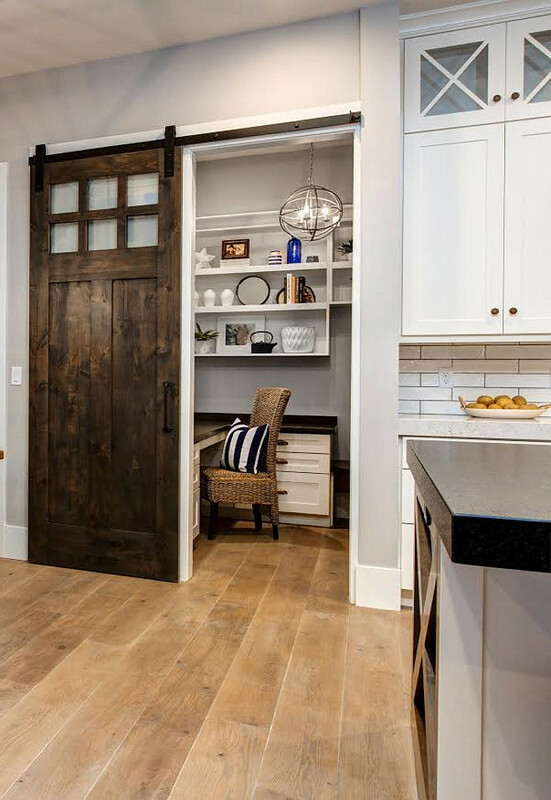 A custom-built barn door conceals a home office. 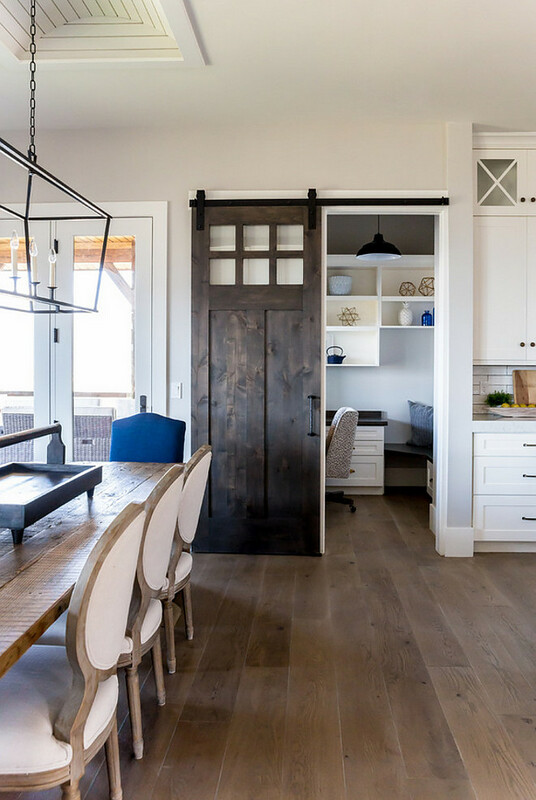 The dining area features a patio door which opens to the main back deck. 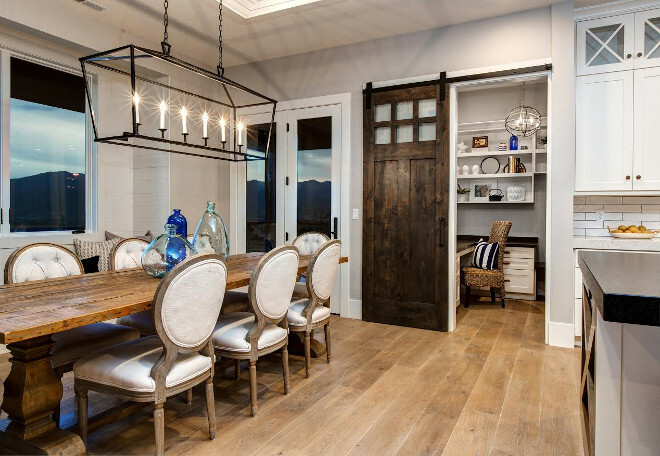 I love this dining room… Don’t you? This is just perfect! 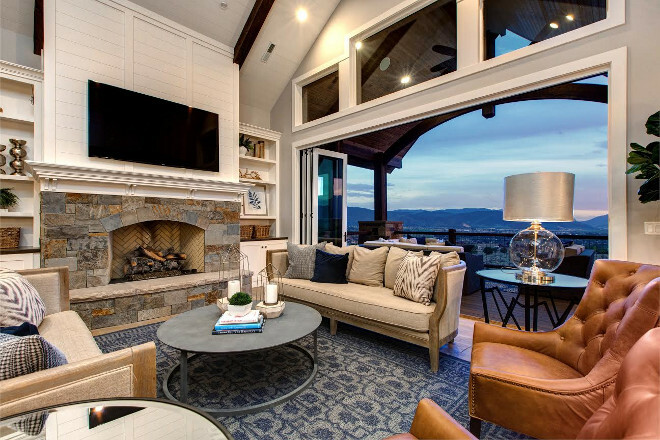 Notice the window-seat and the Darlana Linear Chandelier. Floors are natural White Oak 8″ planks. 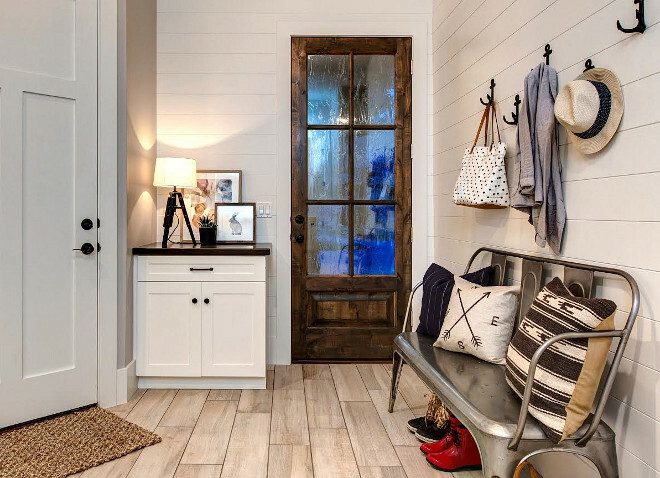 Barn door stain color is Smoke from Jones Paint and Glass. 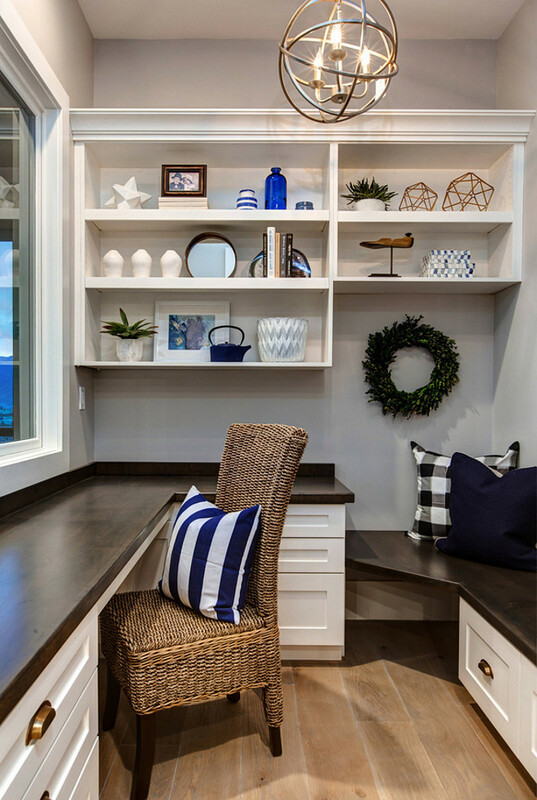 This home office by the kitchen is a great little space to enjoy the views and answer to emails. 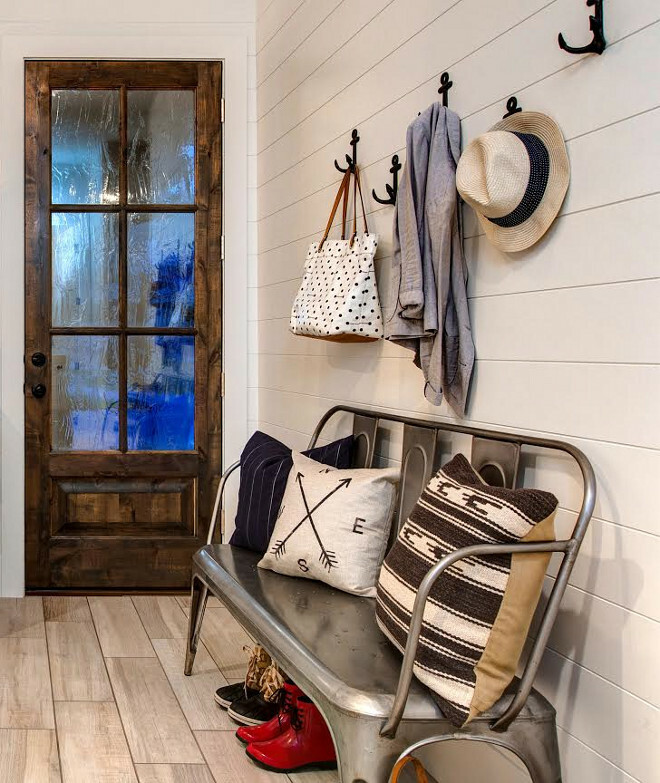 The kitchen also opens to a practical mudroom. This door opens to the side of the house. 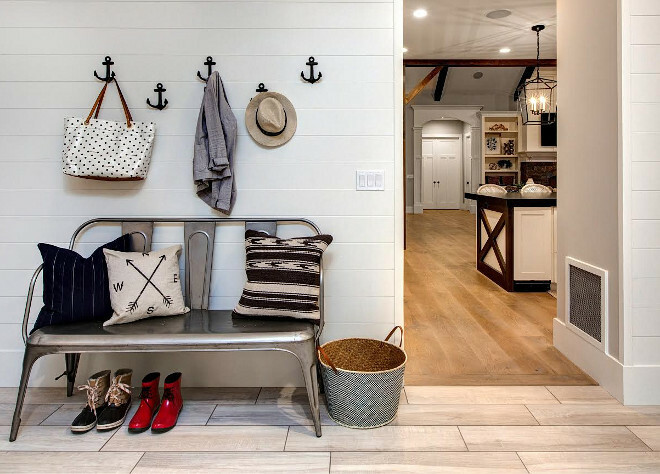 Anchor hooks and shiplap walls bring a coastal look to the mudroom. Make sure to add some comfy pillows to add more comfort and texture to your bench. Basket is from Serena & Lily. 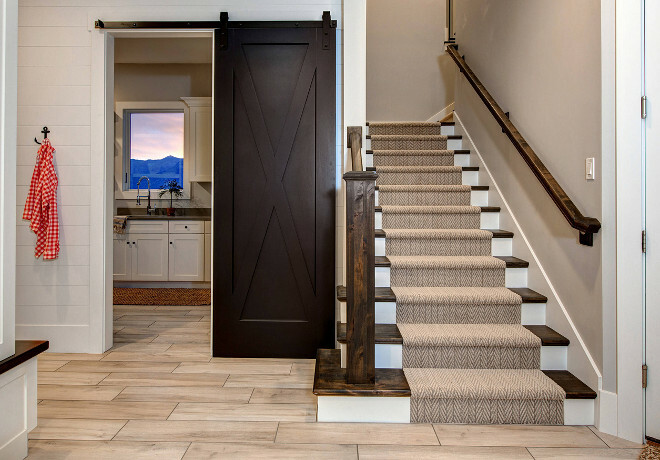 This staircase leads to the second floor of the house where you will find a kitchenette, a bunk room and a guest bedroom with its own en-suite. 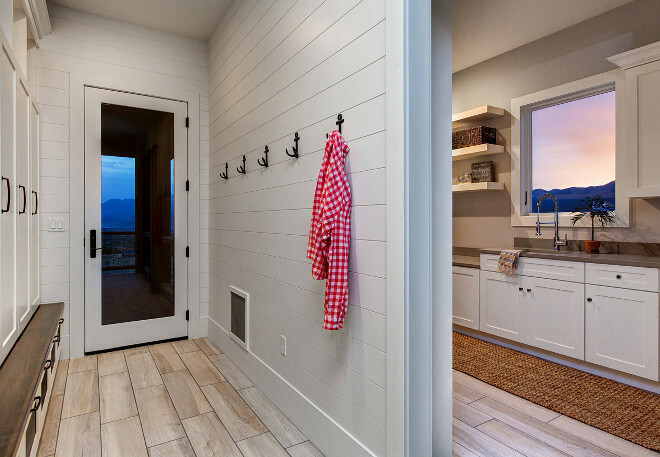 A barn door conceals the laundry room. The staircase features rope railings. 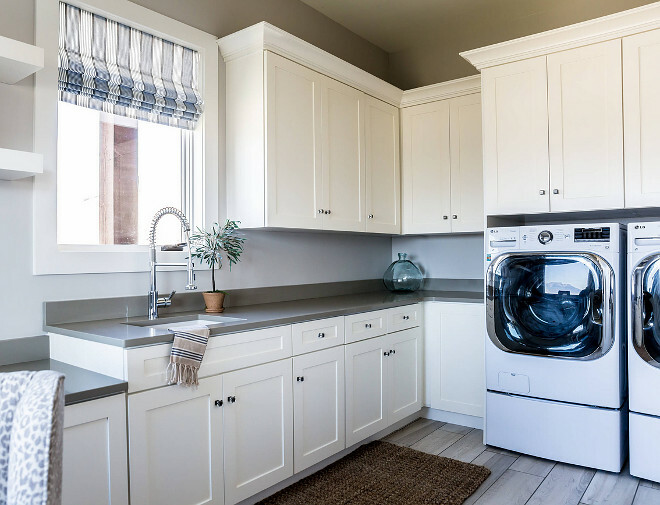 Grey countertop contrasts perfectly with the white cabinets in this laundry room. The cabinets are painted in Sherwin Williams Alabaster. 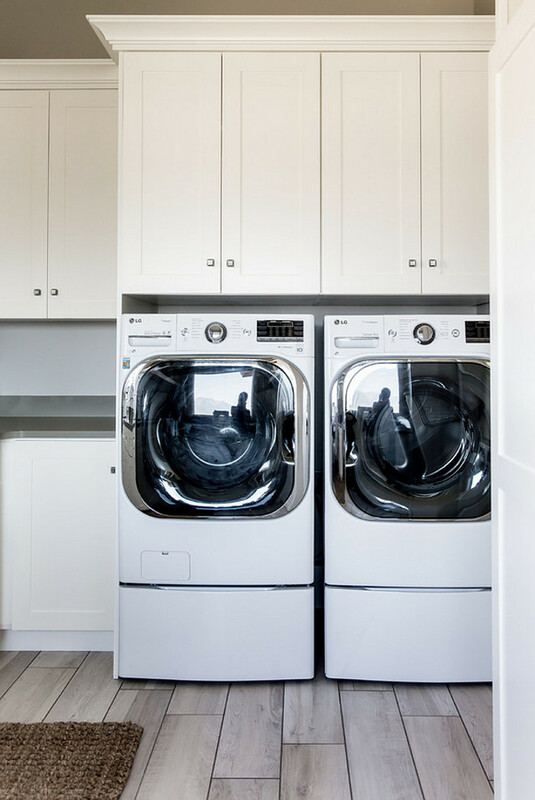 The side-by-side washer and dryer are LG. 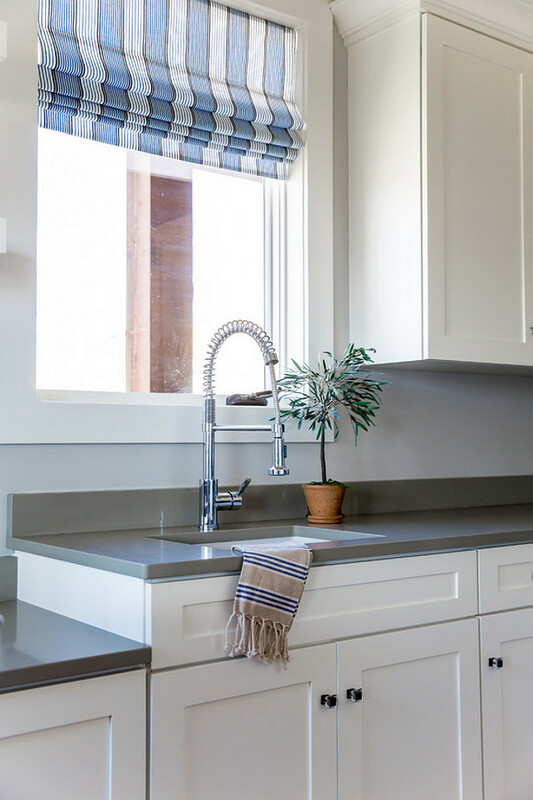 The countertop is grey quartz. 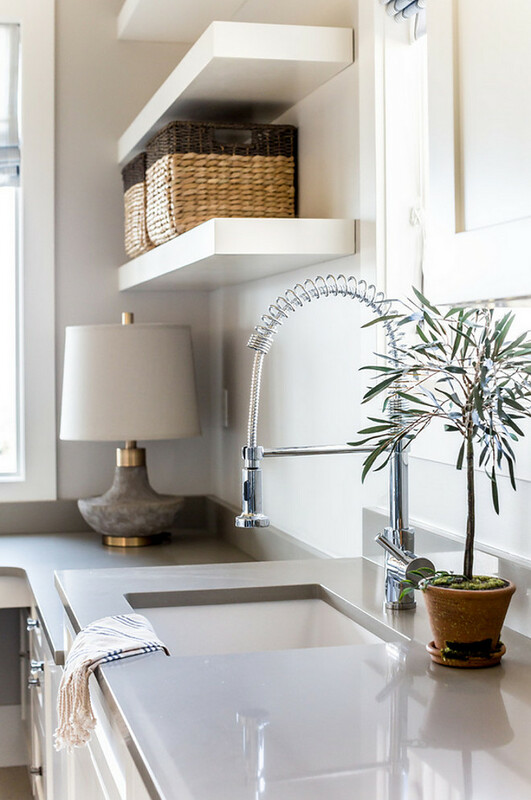 I love how simple and clean the grey quartz countertop looks with the undermount sink. Faucet is from MR Direct. 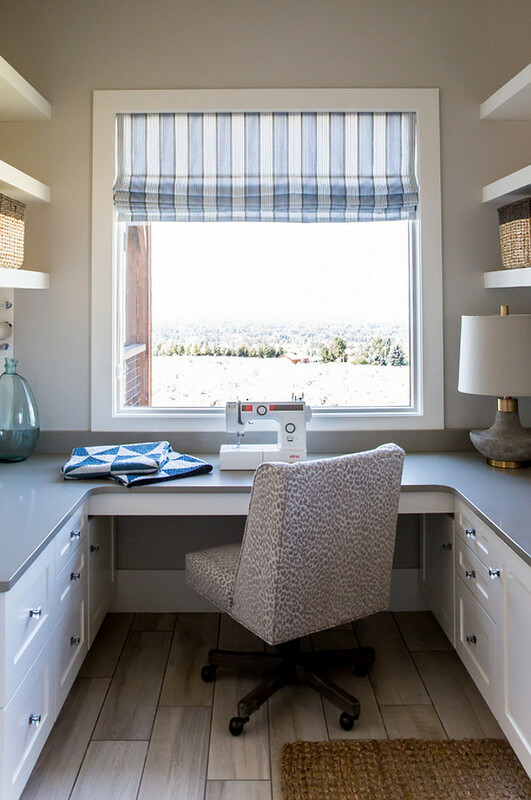 The laundry room also features a sewing space with mountain views! 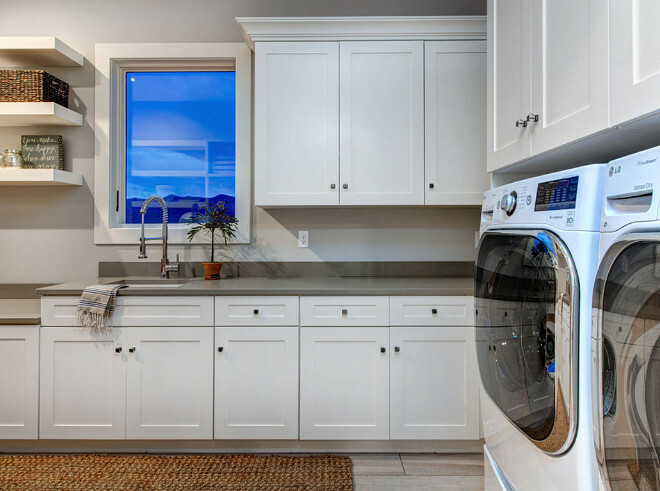 The laundry room opens to the mudroom. The floor tile is from Daltile. 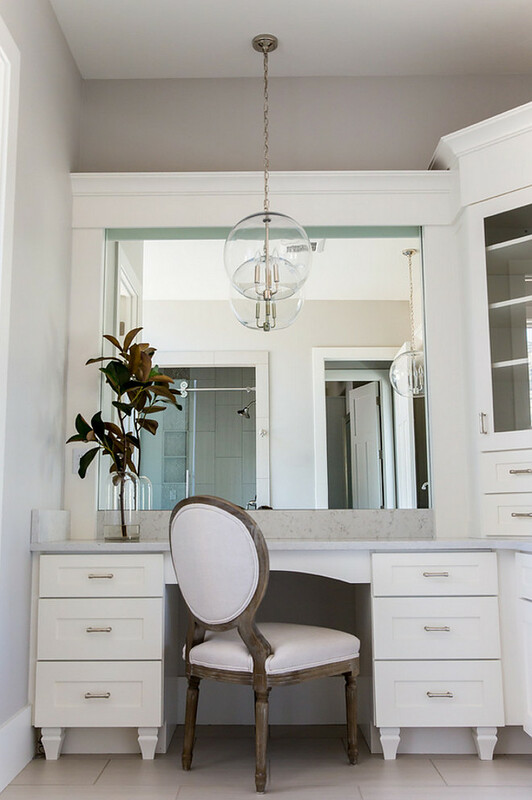 What a cute powder room! 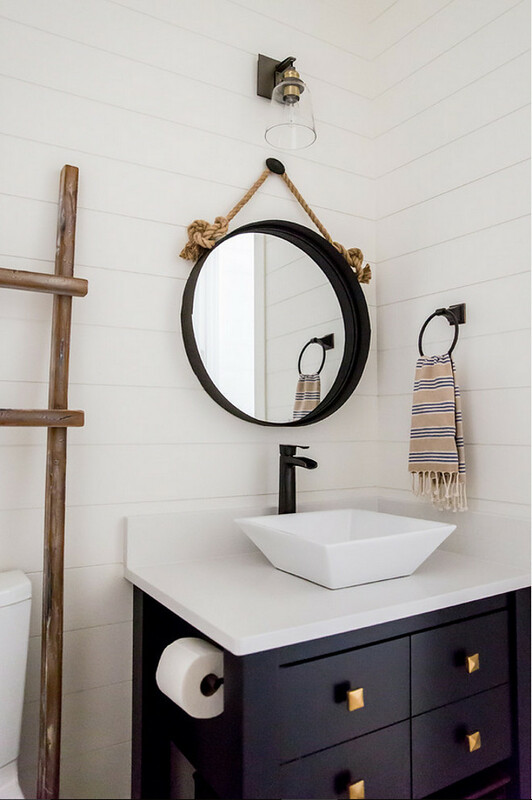 Shiplap walls work great with the navy vanity and the brass hardware. 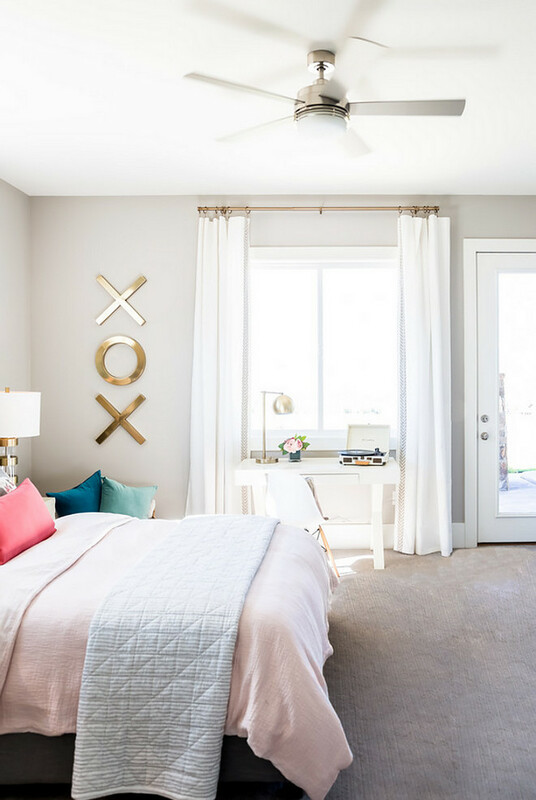 Painted in Collonade Gray by Sherwin Williams, the master bedroom is truly sublime. 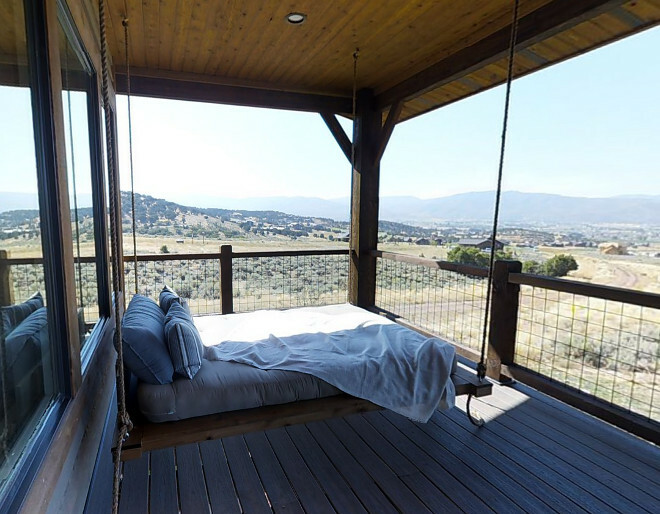 The master bedroom opens to a balcony with a swing daybed with mountain views. How romantic! 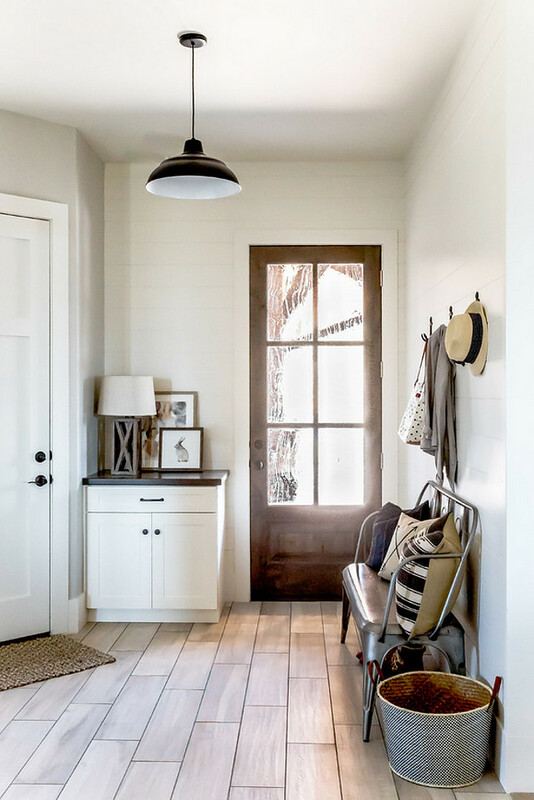 Less is more when it comes to decor in this space. 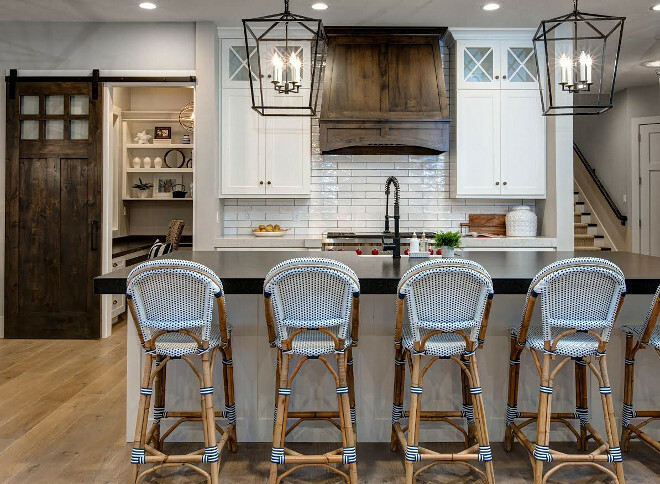 Instead of using sconces, why not go for pendants? These can be found here. Vanity paint color is Sherwin Williams Alabaster. 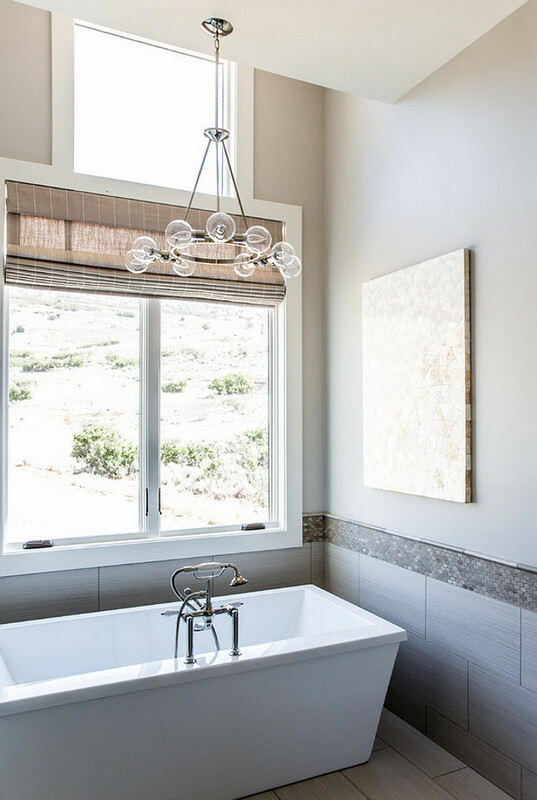 The lighting above the tub is also from Shades of Light. Located in the walk-out basement, this guest bedroom is also painted in Collonade Gray by Sherwin Williams. 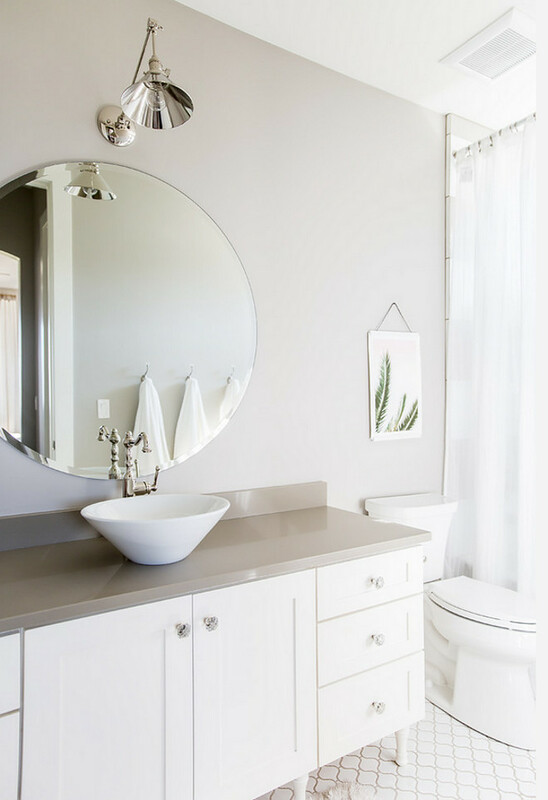 The grey walls in this bathroom are painted in Collonade Gray by Sherwin Williams. 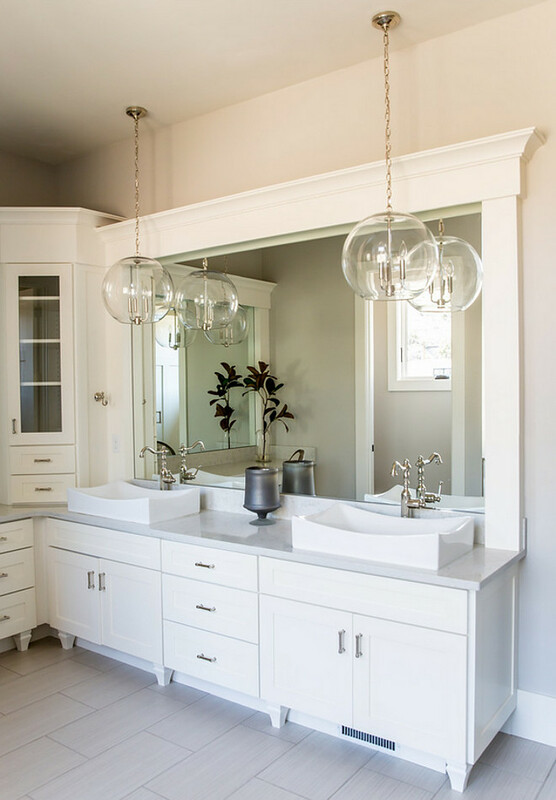 The white bathroom vanity is painted in Alabaster Sherwin Williams. Countertop is grey quartz. 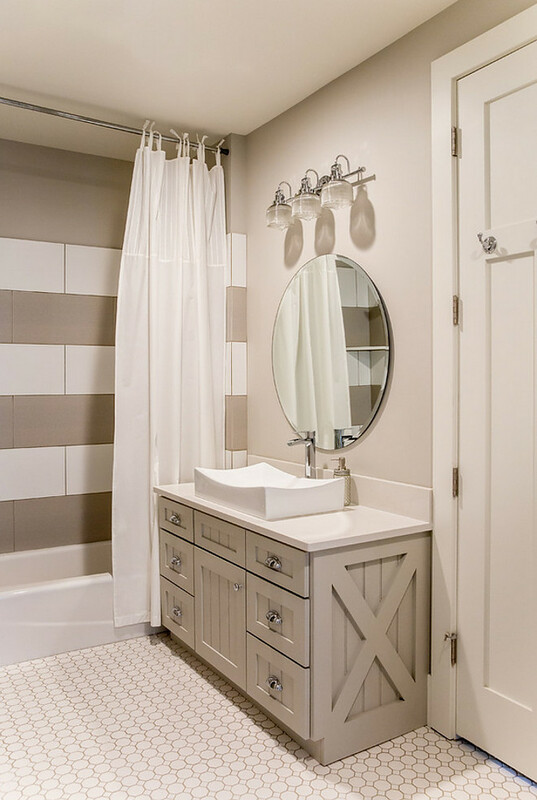 White tile and grey Arabesque tiles are lined in stripes in this shower. Fun idea! What a dream space! 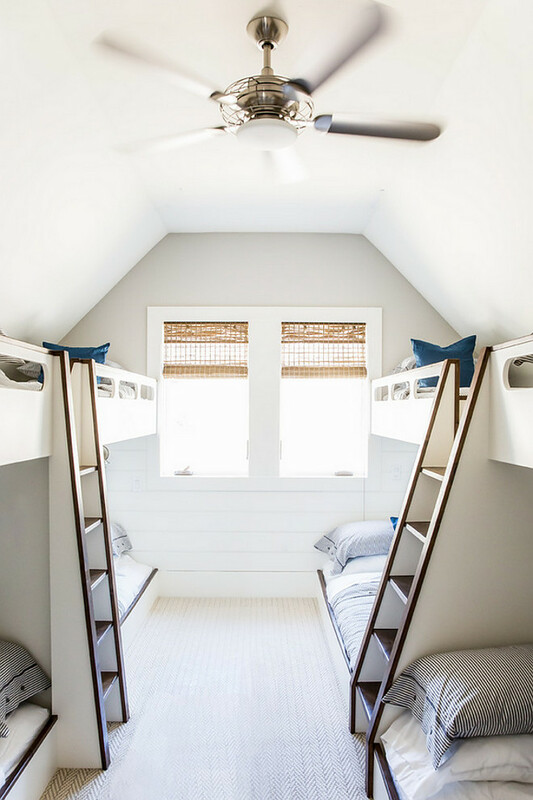 Take a look a this bunk room with eight bunk beds and built-ins ladders between the bunk beds. Perfection! 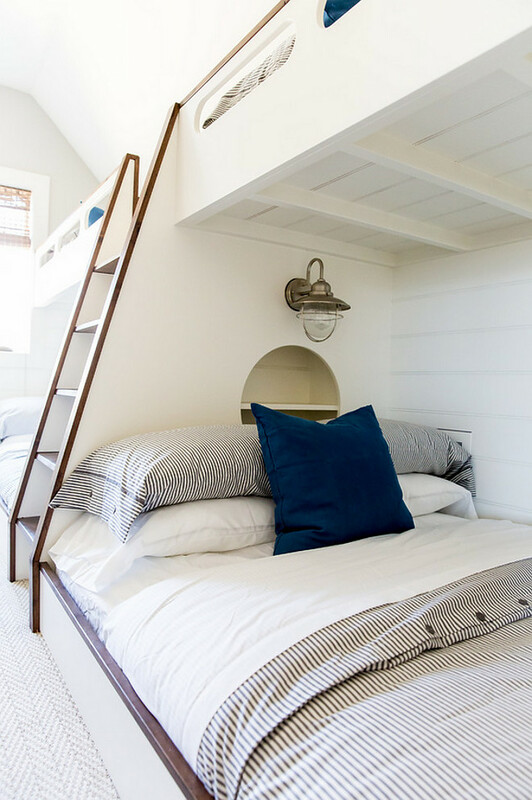 The white bunk beds feature alder trim, nautical lighting and built-in bookcases. 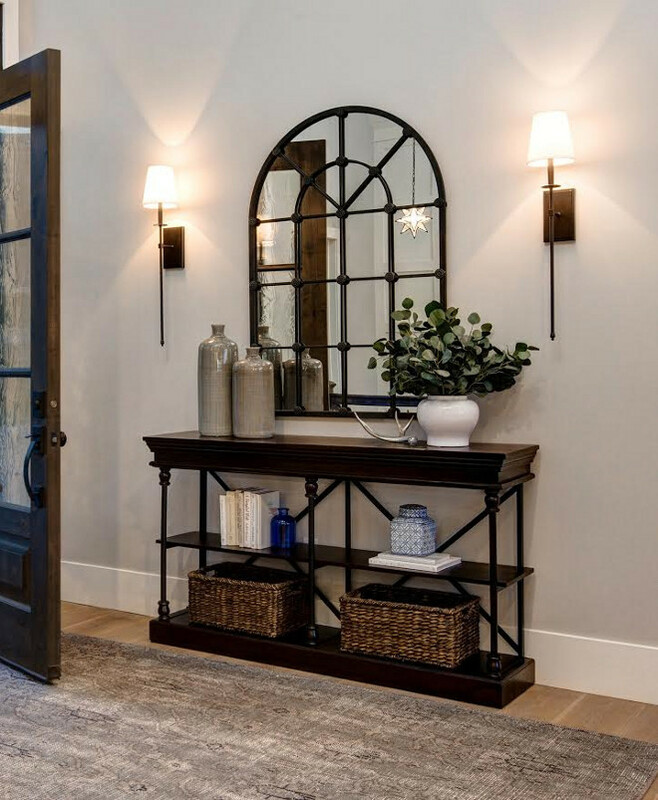 Sconces are from Shades of Light. 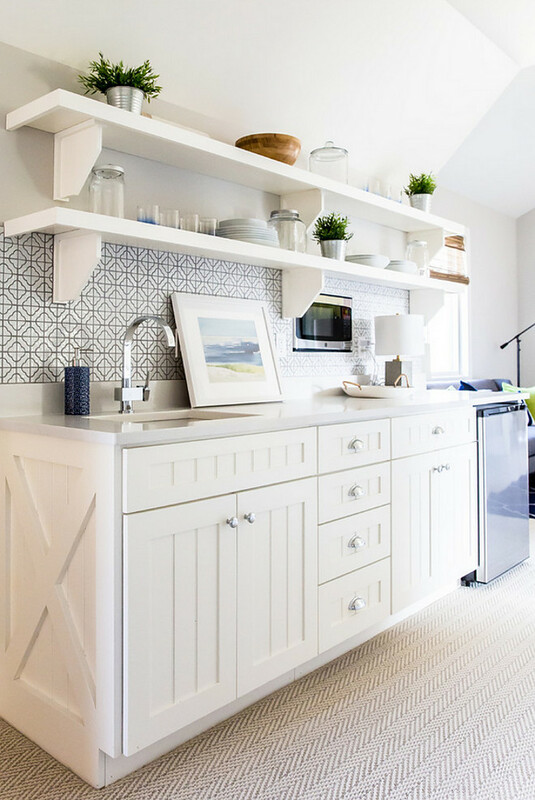 Located on the second floor, this mini kitchen is just off the mother-in-law suite. 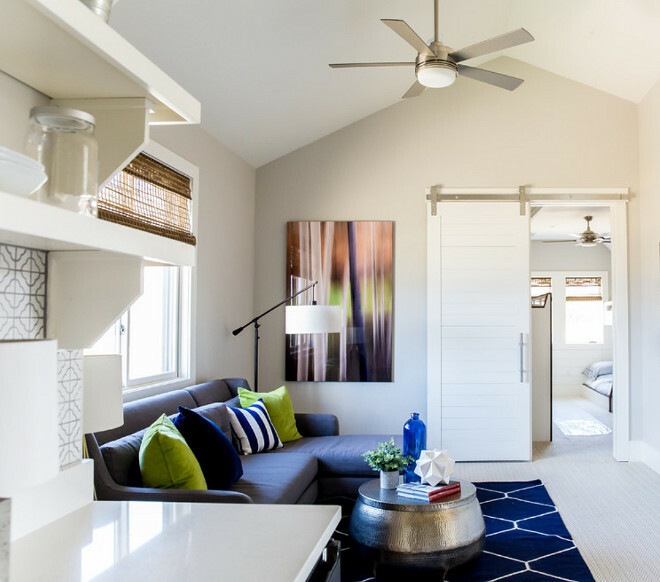 This space also features a colorful family room with barn door. The microwave was installed in the wall to free counter space. 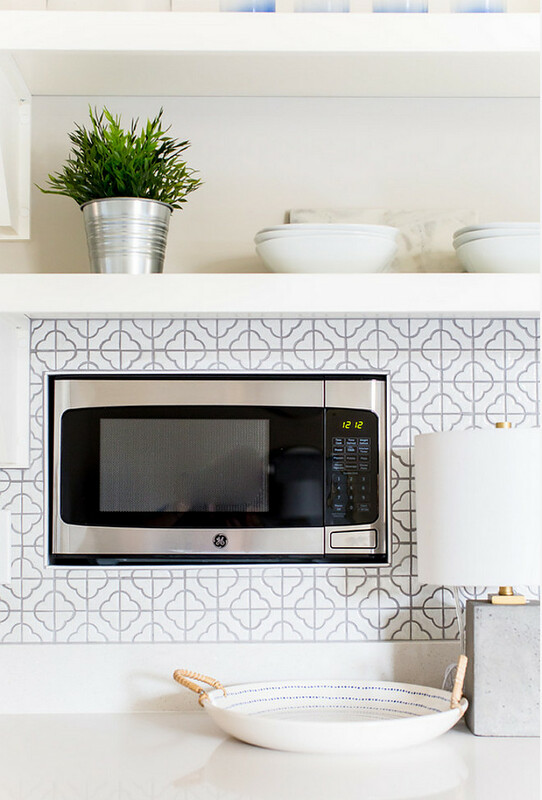 I love this cute backsplash tile with grey grout. Faucet is from MR Direct Faucet. Notice the open shelves. 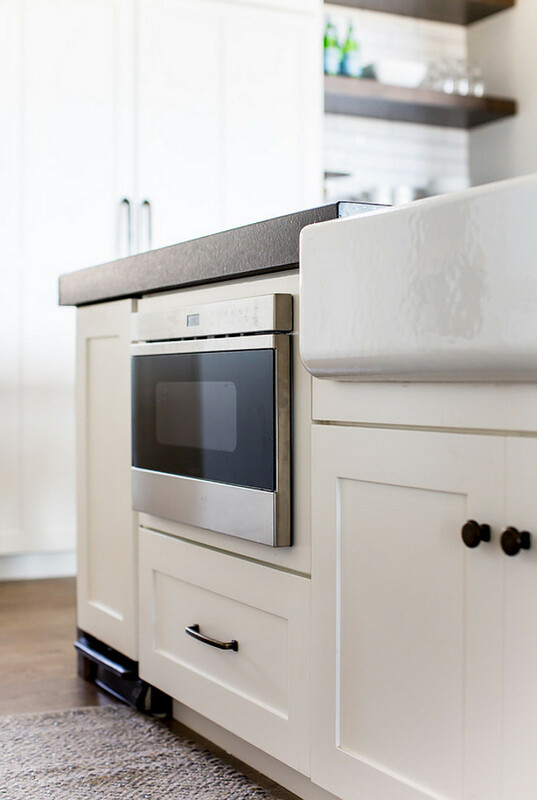 Cabinet paint color is Sherwin Williams Alabaster. 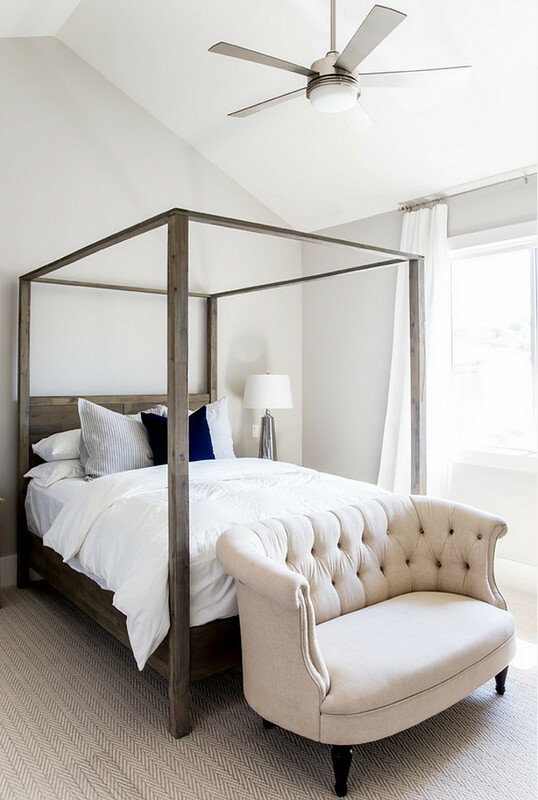 The in-law master suite is inviting and comfortable. Notice the beautiful carpet flooring. 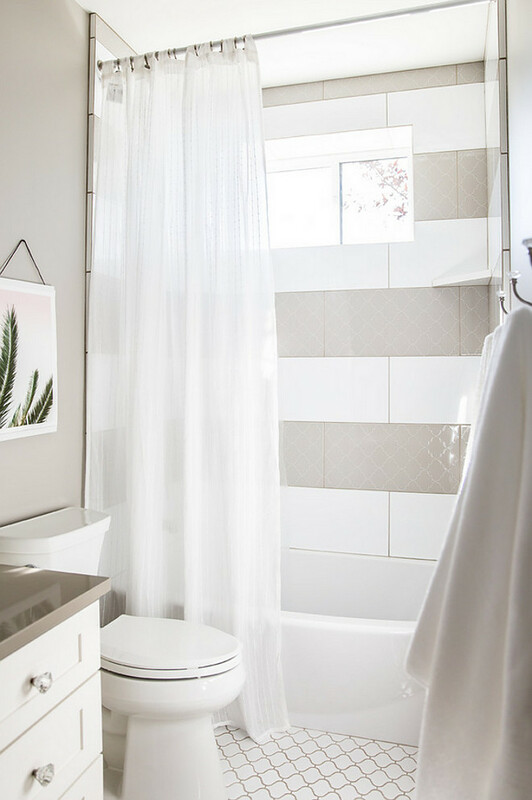 This greige bathroom features grey vanity, white quartz countertop and striped white and grey shower tile. 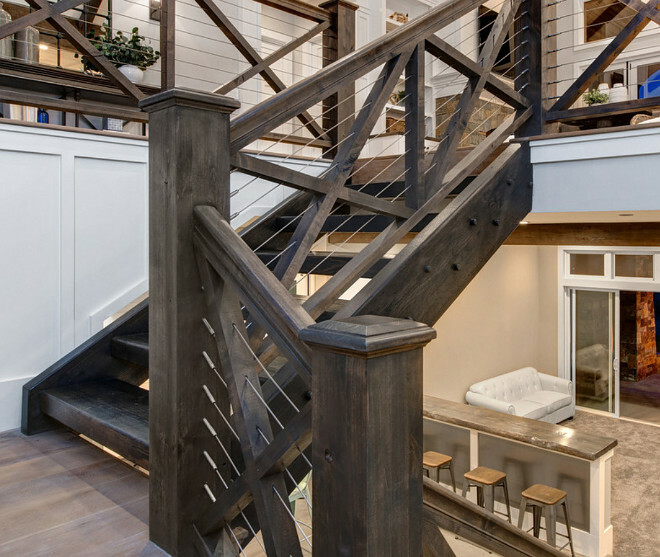 Leading to the basement, the main staircase features crossed wood balusters and cable railing. 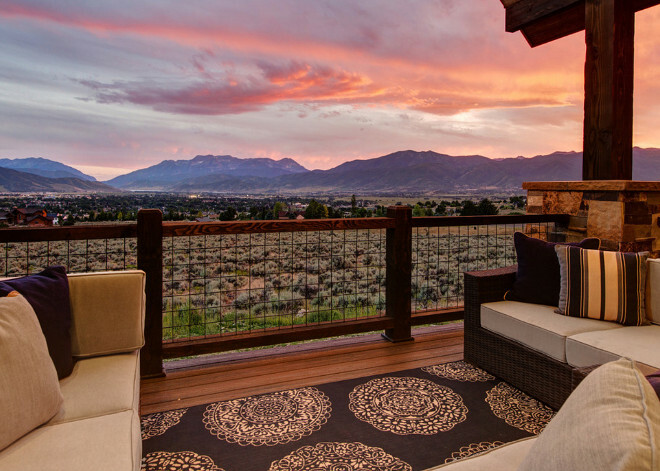 It’s easy to fall in love with this home… It’s truly perfect, inside and out! The outdoor furniture is from pottery barn. The deck features timber and wire mesh railing. 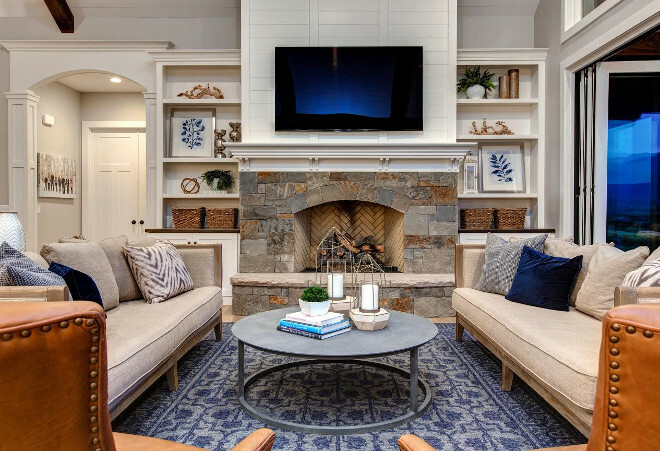 Tuesday: Classic Shingle Style Home with a Coastal Flair. Isn’t this home incredible? This one really calls my name! Oh, imagine living with those views!!! I hope you’re all feeling well, feeling happy and Loved! 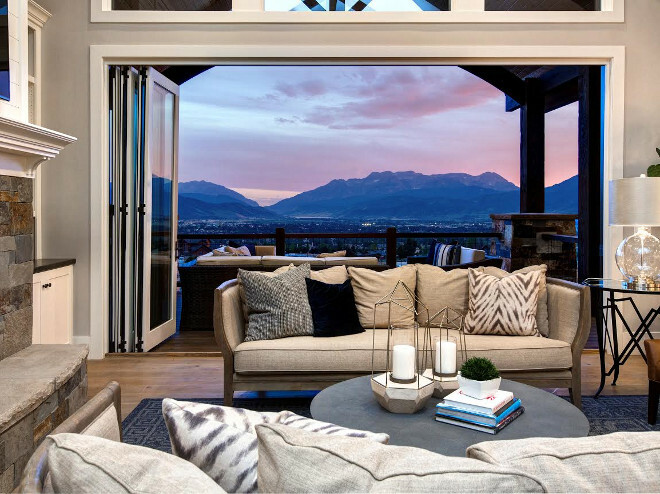 Wow, you’re right, the setting, the views, the decorating and the architecture–It has it all! Gorgeous! Does the floor plan for this house or similar layout happen to be on this website or pinned?! 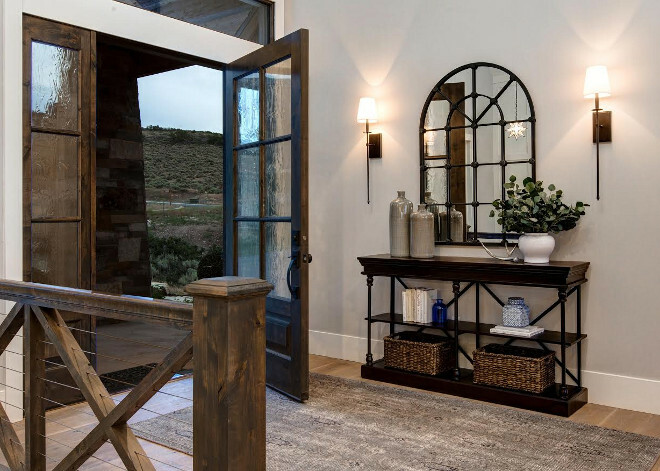 Am wondering where you found the beautiful console table for the foyer in the Timber Frame Home? Thanks!